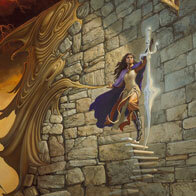 Michael Whelan will be the Artist Guest of Honor at MINICON 50, taking place over Easter weekend. 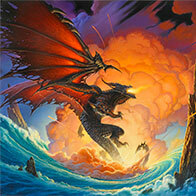 There he will have original art on display—as well as available for purchase—in the art show. 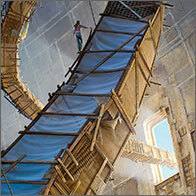 Mention this post and receive 20% off prints, posters, and books at the Whelan.com tables. 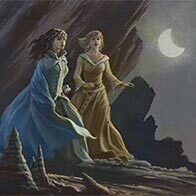 The convention will be a great opportunity for fans in the Midwest to meet not only Michael but also legendary publisher Tom Doherty of Tor Books, and a trio of fantastic writers: Brandon Sanderson, Jane Yolen, and Larry Niven. We just emailed our final holiday newsletter for 2014 and would like to take a moment to wish you safe and happy holidays during this busy season. Thank you for all your interest and support this year! Just a reminder – today is the last chance to order for regular delivery by Christmas. If you’re still looking for that special gift, there is new original art in our shop. And, of course, we’ve added new prints for the holidays as well. Free Shipping on all orders TODAY 12/17 at noon until tomorrow 12/18 noon EST. Free Shipping on all Dark Tower prints until January 5, 2015. Order WAY OF KINGS, WORDS OF RADIANCE, or A MEMORY OF LIGHT and receive DRAGONSBANE free until January 5, 2015. Cyber Monday Special – 24 hour sale! 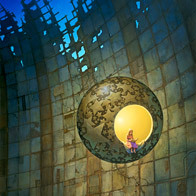 To receive 20% off all Michael Whelan prints, enter promotional code CYB-14 during checkout. Promotion ends at 6 PM EST on Tuesday, December 2nd. Discount is applied to subtotal and will not combine with any other promotional offer. 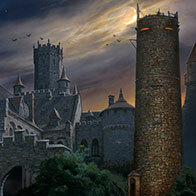 Michael Whelan and Stephen King first met in 1979 when both were Guests of Honor at the World Fantasy Convention. 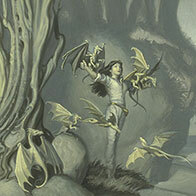 The meeting led to Whelan’s first illustration for King, the cover for a slipcased limited edition of Firestarter published by Phantasia Press. Michael Whelan’s original painting FIRESTARTER goes to live auction with Heritage, an online auctioneer of collectibles, on October 17-18. 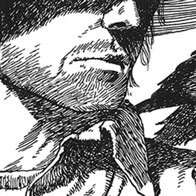 In 1980, Phantasia Press commissioned Whelan to illustrate the cover of their slip-cased, limited edition of the novel, which would be Whelan’s first work for Stephen King. 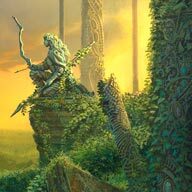 The next major exhibition of Michael Whelan’s artwork will be at Tree’s Place Gallery in Orleans, Massachusetts from July 19-24th, with an opening reception taking place on Saturday from 5-7pm. With this painting I revisit themes developed in my “Passage” series, which featured heavily in my first couple of one-man shows at the Tree’s Place gallery. All of the Passage works use the dream-object of the lighted bubbles—symbols of spirit or unfettered consciousness—to convey the idea of movement from one state of mind to another, a transition to a more open and lighted place; a release. This is one of a pair of paintings done as an experiment to see how readily my acrylic painting style would work in the egg tempera medium. Both paintings are compositions using the same symbolic elements: an egg, an ammonite fossil, and the leaf of a ginkgo tree. 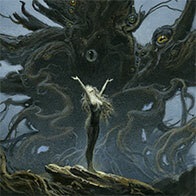 This weekend Michael Whelan won his 30th Locus Award for Best Artist. Thanks to all the voters of Locus Magazine for such consistent support throughout the years. The Locus Awards often fall on Michael’s birthday so this has become quite a tradition. Today happens to be Michael’s 64th. If you’d like to wish him a happy “Beatle” birthday, head on over to his Facebook page and join the fun.